13 Above: Obama Introduces Puppy In Politics ? It is the most widely anticipated appointment of Barack Obama’s new administration and today, after months of fevered speculation, the White House welcomed the new First Dog. With one hand round his youngest daughter Sasha, the President used his other hand to pet Bo, a six-month-old Portuguese Water Dog, as the First Lady Michelle and their other daughter Malia looked on. The lucky canine is a gift from Senator Edward Kennedy and his wife Victoria to the President's daughters. The dog was bred at the kennels in Texas and sold to someone who returned it. Ever since Mr Obama announced on election night last November that he would be buying his daughters a dog, America has been obsessed by the type of puppy the family would choose. 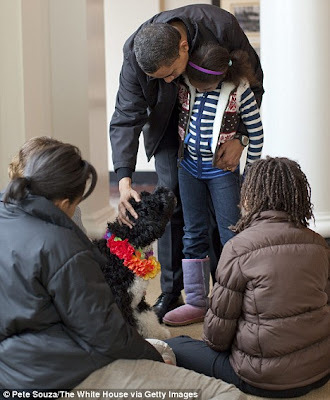 The Obamas opted for a Portuguese Water Dog because their eldest daughter Malia, ten, suffers from allergies and, rather than fur, the breed has hair it does not shed. Its distinctive curly coat is similar to a poodle’s and needs trimming every couple of months, particularly around the eye area. Sasha and Malia now have a new friend in the White House. In an interview with People magazine in February, First Lady Michelle Obama confided she favoured the Portuguese breed and that a dog would be moving in after the Easter holidays. 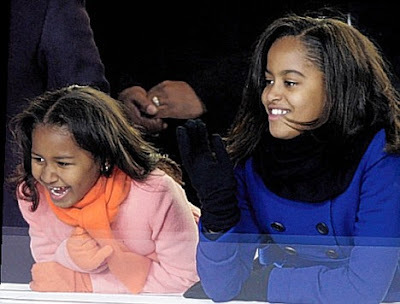 She said the family had discussed names with Malia and her seven-year-old sister Sasha but had rejected Moose and Frank. 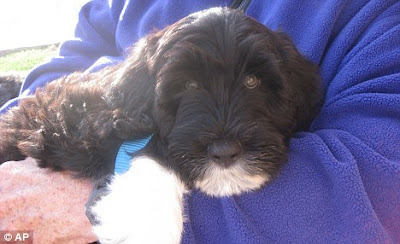 Senator Kennedy has owned three Portuguese Water Dogs, including his current dog Cappy – short for Captains Courageous. The 77-year-old, who is battling brain cancer, is said to have persuaded the Obamas that the breed was ‘perfect’ for the White House. The source said: ‘Senator Kennedy got his dogs from the same kennels and they have been robust, healthy and very good-natured animals. The speculation about the arrival of the First Dog reached fever pitch after a public event in the new White House vegetable garden last Thursday. Previous White House pets have become mini celebrities. George W. Bush’s dog Barney, a Scottish terrier, even had his own website. Meanwhile, it was revealed yesterday that a British ancestor of Mr Obama left 12 pence to his son in his will.